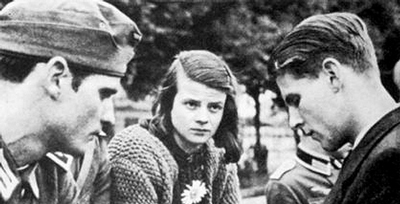 In 1943 a small group of student-activists known as The White Rose (die Weiße Rose), were arrested and summarily executed. Their horrendous, traitorous crime was to author and distribute pamphlets, in their university town and across southern Germany, in opposition to Hitler’s Third Reich. Twenty-two year old Sophie Scholl and her brother Hans were among the first beheaded. Though the efforts of us bloggers and those of us who are organizing to resist the Trump administration agenda hardly measure up to the patriotism and courage of die Weiße Rose, it is not much of a stretch to liken the POTUS tweets to Adolph’s fragile narcissism. When, with a friend, we first proposed a group locally to resist the Trump agenda, I put forward “Sophie’s League” as our name, after the 1943 martyrs, my friend helped me see that few would recognize the significance of the name and that I was inflating the significance of our group by reference to die Weiße Rose. Agreed, compared to the historical significance of resistance to Nazism, our efforts pale. It is nonetheless an honor to step into the very long line of opposition to the megalomania of a tyrant and fool. 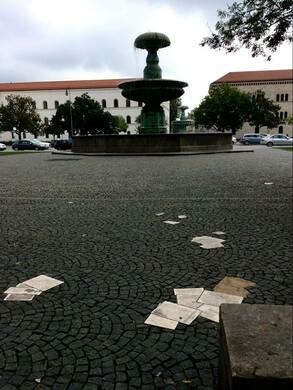 The square in which the memorial, bronze pamphlets scattered across the cobblestone, can be found now bears the name Geschwister-Scholl-Platz (“Scholl Siblings Square”) in Munich, Germany. Here Sophie is said to have tossed a handful of pamphlets into the air as the Gestapo approached to arrest them. If you are at all familiar with the story of Moses in the Book of Exodus in the ‘Hebrew Bible,’ The Torah, you’ll know that Moses’ view from Mt. Nebo was a bit disappointing. It was there that YHWH informed him that he’d have to view the Promised Land from afar, that he wasn’t going to make it there. In the past week, the longing that must have weighed heavily on Moses has been somewhat familiar to me. It is very possible that I too just might die before I can enter the land of my hope. I am 76 ½ years old and even without a second term on Trump’s part, I could die while he is in office. OMG, I was born under FDR and could die under DJT! Not if I can help it! So I hear of INDIVISIBLE, an idea, becoming a movement, that invites/urges old-timers like me and, in fact concerned citizens of all ages, to resist the authoritarianism, racism, white-nationalism, misogyny, etc of the Trump administration, at my local level. I download the INDIVISIBLE strategy from their website. It really makes sense. It should; it is offered by ex-staffers from the Obama years who saw the devastating effect of the Tea Party offensive against each and every progressive idea and invites Progressives to organize in a similar way wherever we are. I am determined to do all that is within my capabilities to assure that I do not die during the reign of the current POTUS. That he is POTUS, I neither doubt nor deny, but he is not my President. I pledge allegiance to the flag and its republic, not to its President. I was not born under FDR, did not cross the bridge with Dr. King the weekend that Viola Liuzzo was assassinated by the Klan, oppose the Vietnam War, only to live long enough to have to endure more than one term of Trumpism. Of course, I am fully aware that I have nothing to say about when/where I shall die, even though my current health does not cause me alarm. But I pledge whatever healthy life is mine and my meager resources to resist Trump. I was once a Protestant pastor, but that Church left me long ago, to be overwhelmed by christo-fascists. I will oppose them and resist them at every opportunity. I may not get to the Promised Land and my view may remain from here on Mt. Nebo, but all my effort will go to seeing that you do not have to gaze from here long.